This video shows how to solve using substitution. To solve using substitution, set both equations equal to each other if they both equal y. This can only be done if you have one equation in terms of a variable. By having an equation equal to a variable, you can plug into the other equation in terms of that variable, and solve. If an equation is NOT already equal to a variable, then you would have to isolate a variable for the equation(s), so that it can be plugged into the other equation. After that, you solve for the missing variable and plug it back into one of the original equations to get the value of the second variable. The x and y-values are the coordinates for the point of intersection of the two lines. To check this, plug both x and y-values into an original equation and simplify to see if it holds true. After solving, we find that x=2. Then plug in 2 for x in either equation to solve for the y value. Therefore, the solution is (2,3). 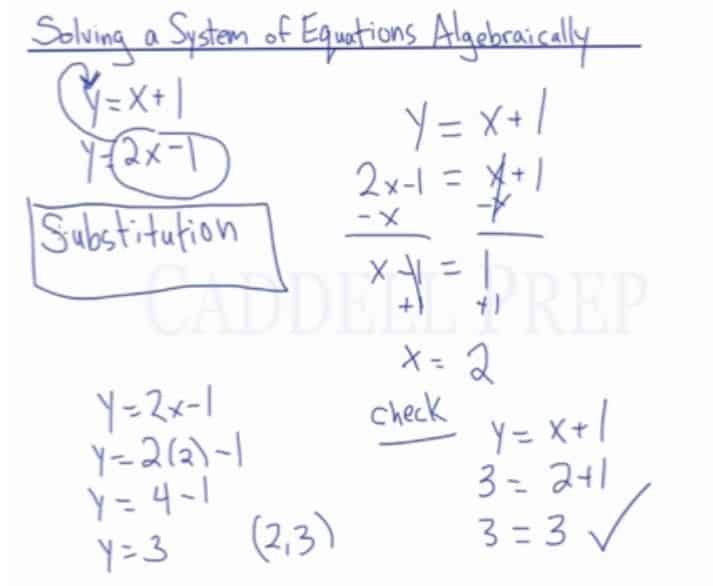 In this lesson, you will learn how to solve a system of equations algebraically. We’re going to use algebra to solve for one of the variables. After that, solve for the other variable. But the problem is we have two equations with two missing variables at the same time. So to solve that, we have to find a way to combine the two equations with only one variable. So what we’re going to do is to get one value of and substitute it to the other equation. In this way, we can eliminate one missing variable. Let’s take the value of in the second equation and substitute it to the first equation. Again, we just get the value of in one equation and substitute it to the second equation. This process is called ‘substitution’. Going back, let’s solve the equation first by subtracting on both sides of the equation. Then to isolate the , we have to add on both sides of the equation. But the value of isn’t the final answer. We also need to know what is the value of . To solve that, let’s just take one equation and substitute the value of . then plug the value of . In order to check this, let’s get the other equation and plug the value of and . So here, you learned how to solve a system of equation algebraically using substitution. Just a quick recap, we get the value of in one equation and substitute it to the other equation to solve for . Then, we plug in the value of in one equation to solve for the value of . We also check if we got the correct answer by getting an equation and plugging in the value of and . So let’s have another example. This is an example of a system of operations where one equation already solved the value of . While the other equation is not. Notice that already has a value for . Now, let’s isolate the by adding on both sides. Then, let’s plug the value of into one equation to get the value of . Since we used the top equation to solve for , let’s use the bottom equation to check. To recap, we get the first equation and substitute it to the value of in the second equation to solve for the value of . Then we plug the value of in the first equation to get the value of . To check our answers, we plug in the value of and in the second equation. In this case, neither one of the equations solved the value of a variable. So what we’re going to do is to solve for one of the variables in one of the equations and then use that to substitute into the other. For me, it will be easier to solve for the value of using the top equation. To solve for , let’s subtract from both sides of the equation. Note that is negative. We don’t want a negative . So to make it positive, we have to divide both sides by . Now, let’s solve the value of by substituting the value of to the bottom equation. Now, let’s solve for the value of by plugging in the value of on one of the equations. Then isolate by subtracting on both sides. Then divide both sides by . This is probably the most difficult one.